Potty training helps puppies understand what toileting behaviors are acceptable and which ones aren’t. You train them every single day. You use housetraining aids such as pheromone-laden potty training pads. You create a schedule for their elimination activities. As such, it is quite understandable that you will be so upset when you see that your puppy urinated in an area where it shouldn’t. 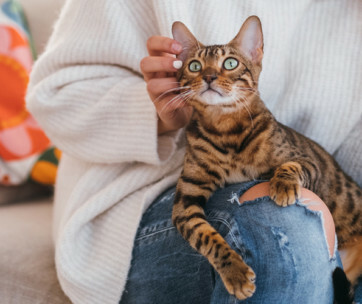 How you answer the next question will help define the type of pet parent that you are. How do you discipline your puppy for urinating? When pet parents see their puppy urinating in a “forbidden” area, the natural reaction is to shout at the young dog. They can yell at the hapless puppy in an attempt to stop it from what it’s doing and to instill fear. In some cases, the master may also punish the young hound by hitting it or performing the classic alpha roll. This is a very controversial dog training method whereby the animal gets pinned on its back. In some cases, the “alpha” will hold the dog by its throat as it gets pinned to the ground. There are also those who advise rubbing the puppy’s nose in the area it soiled. They say that this is to teach the puppy never to urinate in this area ever again. The smell of urine plus the act of having its nose rubbed against an unpleasant object are thought to provide the necessary learning for the pet. But do these methods work? Does punishing the puppy help prevent any future incidents of soiling? It may or it may not, but one thing is clear – punishing your dog will leave a big scar in its mind. It will never understand why you yelled at it. The puppy will never comprehend why you have to pin it against the ground and hold its throat while yelling at it. The young dog will never appreciate why it’s necessary to rub its nose against something that smells awful. Why doesn’t the dog understand, you ask? The short-term memory of dogs is as short as 5 minutes. Puppies may have shorter memories than adult dogs. This means they can never build associations in the same way that we do. Hence, if you yell at them or punish them several minutes after soiling, they may never form such associations. As such, they will never know that the punishment is due to their soiling. While the puppy may not form associations between the deed and the punishment, what it knows is that you’re upset or angry. Dogs have this uncanny ability to decipher human mood because of a special organ in their nose. In the rare instance that you caught the puppy in the act of urinating, punishing it right away may not also solve the problem. As a matter of fact, the issue can only worsen. Think about it from the point of view of the puppy. If you catch it urinating and you punish it, it will associate the punishment with its urination. However, it also associates it with the fact that you saw the puppy doing the deed. They learn that you’re angry because you saw them peeing and not because they urinated on a particular area. They also learn that you will punish them if you see them urinating. As such, the next time they are going to pee, they’ll first make sure that you’re not around. There are several ways they can go about such a deed. They may “sneak” into another room and urinate there. They may also try to hold their urine until you’ve moved out of the room. 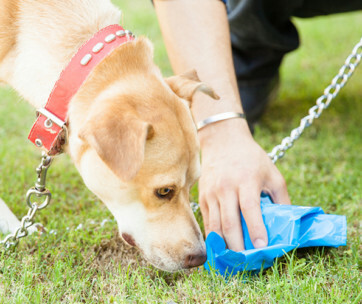 Many pet parents report of such “sneaky” soiling behaviors in puppies and dogs. The point here is that punishing your puppy is counterproductive. Instead of you addressing the problem, you’re making it worse. You’re pushing the puppy to think of other ways in which it can pee without you knowing it. This can have serious implications in the housetraining of puppies. When you walk them outdoors so they can urinate, they may not pee at all. Why? Well, you are looking at them. In their minds, if you see them urinating, then you will punish them for it. As such, they will hold off their urination and wait until they reach home. But they will also not urinate yet. They will try to sneak into another room or wait for you to leave before they urinate. No matter how tempting it can be, don’t ever punish your puppy for urinating in areas where it shouldn’t. If you do, you’re making housetraining extra difficult. Punishing puppies for urinating in the house is never the solution. It is not the way to discipline a puppy. Here are some of the more constructive and more positive ways of addressing the issue. 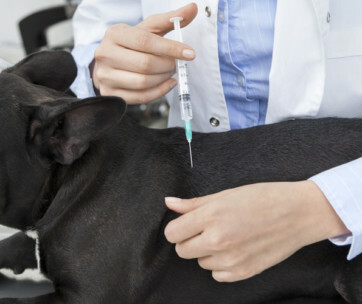 Before you start thinking of more constructive ways to address puppy “accidents” in your house, it is often necessary to rule out any medical conditions first. This is especially true if you have already housetrained the puppy. There must be a more plausible explanation as to why your young dog is urinating in the house all of a sudden. One of the most common culprits why dogs may not be able to control the urge to urinate is the presence of urinary tract infections. Inflammation can cause spasms in the lower urinary tract structures so that urine passes without warning. Another possible explanation is the presence of prostate disease. Inflammation in the prostate gland can cause it to grow bigger. In such instances, the growing prostate gland can compress the bladder and cause it to express urine through the urethra. If these conditions go unmanaged, no amount of behavioral modification or housetraining will be ever successful. As mentioned in the preceding section, yelling or shouting at your puppy when you catch it urinating is never a good way to discipline it. Yelling conveys your emotional state. Dogs, as mentioned, have this very unique ability to sense your mood. They know that you’re upset and that you’re anxious. The problem is that they don’t know why. If they sense that you are anxious, puppies and dogs can grow anxious, too. 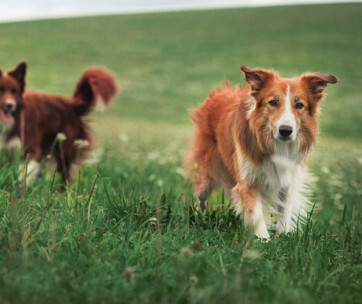 Anxiety and stress in dogs can show the same physiologic effects that anxious humans display. They may experience a greater frequency of urination as well as the inability to control the urge to urinate. Hence, if you catch your puppy in the act of urinating, stay calm and don’t raise your voice. 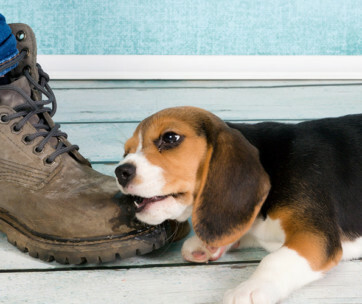 Sure, it may be urinating on your favorite sneakers, but yelling at it will do more harm than good. Aside from staying calm and composed, you also need to stop your puppy from urinating. If you see it peeing in your house, call its name in a calm yet assertive manner. There’s no need to shout or yell. You can also distract it by whistling or making the “psst” sound. This should be enough to stop your puppy from what it’s doing. Pick up your puppy and bring it outside the house or you can bring it to its “toilet”. This is when potty training pads are often useful. You can bring your puppy to the pad so it can continue its business there. When picking up your puppy, be careful not to hold it too tight. Some pet parents might not be able to resist the temptation to inflict harm to their puppy as a means of teaching it a “lesson”. Once the puppy has completed its “business”, you should still praise it. Follow it up with a yummy treat. They will associate the act of urinating outside the house or in their “toilet” with something that is more positive. If you caught your puppy already late in its urination, there’s nothing left for you to do. Maintain your composure and keep your temper in check. Don’t shout or yell and don’t punish the puppy. What you can do now is to clean up the mess. Make sure to clean it very well. Dogs have a very acute sense of smell. What this means is that they know if a particular area is for “toileting” or as the boundary of another dog’s territory. Your best bet is to use pet urine removers and cleaners that contain enzymes. These will break down scent particles so the surface will not have the characteristic smell of pet urine. Remember, you may not smell it, but your puppy does. 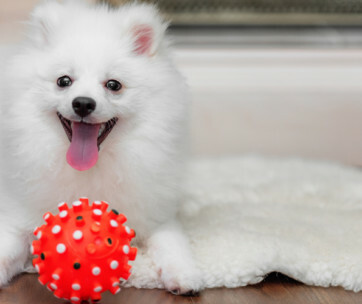 Housetraining your puppy the correct way can help minimize accidents in the home. Here’s how you can ensure a more successful puppy housetraining. Puppies are like human babies. They have a very straightforward routine. Their schedule focuses more on eating, eliminating, playing, and sleeping. Establishing a routine is crucial to the success of potty training your puppy. A good rule of thumb to follow is the number of hours a puppy can hold its urine is equivalent to its age in months. For instance, if you have a 3-month old puppy, then you can expect it to hold its urine for up to 3 hours. As such, you will need to bring it out to pee every 3 hours. Puppies also need to pee right after waking up, after drinking or eating, and after playing. Hence, you need to factor these bits of information in your puppy’s toileting schedule. Part of a puppy’s toileting routine is the identification of a “toilet” area for the young dog. This will be the puppy’s go-to spot when it needs to urinate. It is, therefore, crucial that you train the puppy to go to this place whenever it needs to do its business. Make sure to reward your young pet every time it urinates in its “toilet” area. This will help reinforce the behavior you want from the puppy. You’re teaching your pup what you expect it to do. It may also help to feed your puppy on a more regular basis. 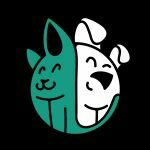 Since puppies defecate and urinate within 30 minutes after a meal, establishing a meal time can help in the creation of a more efficient toileting schedule. This helps ensure more consistent elimination at specific times of the day. About two to three hours before your puppy goes to sleep, it’s wise to remove its water bowl. This minimizes water intake prior to sleep, which can help in minimizing the need to urinate at night. Housetraining puppies requires pet parents to keep a watchful eye on their young hounds. It’s imperative to brush up on the signs of an impending puppy urination. For instance, scratching the door and circling in one place are almost always good indicators that the puppy is about to go. Other cues can include sniffing around, restlessness, barking, and squatting. If you do see these signs, grab the leash and bring your pet to its “toilet” area. As soon as the puppy completes its toileting, praise it and give a treat. There will always be instances when you cannot supervise your puppy. In such instances, it’s always a good idea to confine the puppy in a small area. It should be small enough that the puppy will not want to urinate or defecate there. Most pet parents will use pet gates to create a smaller space in the laundry room or the bathroom. A good alternative is to train the puppy to love its crate. Crates come with a smaller space. Puppies may not want to urinate or defecate in the same area where they are resting in. Do remember, however, to bring the puppy to its “toilet” upon your return. Disciplining a puppy for urinating should never involve punishment. Always approach the issue in a calm manner, assess the problem, and decide on the most constructive way to manage it.